On my rankings list of favorite seafood, scallops fall right below steamed crabs. Unfortunately, it’s hard to get them around here for a reasonable price. Most grocery stores offer the frozen variety with the origin unknown. No thanks. Or to get fresh ones, my only choice is Giant which is not close by or Wegman’s which charges something like $22 a pound. For something that you nearly need to eat a pound of by yourself to get full, that’s not going to happen. Luckily, my snowbird aunt who spends her summers in Delaware has an in with one of the seafood guys at one of the restaurants down there. He gets them scallops and shrimp and anything else they ask for. 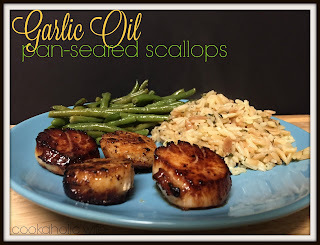 When I was visiting her this past summer, I asked to get in on that deal and I ended up with about 5 pounds of scallops. Which are all nicely frozen in my freezer just waiting to be devoured. 1. Combine the garlic and oil in a small saucepan and bring to a boil. Then reduce the heat to low and cook for 5 minutes more, or until the garlic is a golden brown color. 4. Rinse the scallops from any salt solution they may have been packaged in. Pat both sides with paper towels until dry, then season with salt and pepper. 5. Add 2 tablespoons of the garlic infused oil to a large skillet over medium heat. 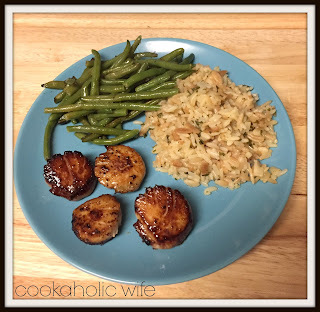 Add in the scallops and cook for 2-4 minutes on each side or until nicely caramelized. 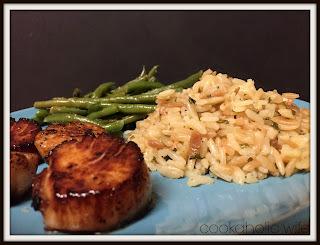 Avoid picking up the scallops as they are cooking or they will never get browned. Flip over and cook for 1-2 minutes on the other side. 6. Add the butter to the skillet and spoon over the scallops. Remove from the heat immediately and serve. You can also use a store bought garlic infused oil if you don’t want to go through the hassle of making your own. If you do make it though, use the remaining oil within the week or discard. These scallops got the perfect amount of caramelization on both sides and were so delicious I regretted not making more.